Having just returned from another visit, I have some new impressions. Above all, I think it worthwhile to note that in all these visits, I have routinely stayed with relatives who live in West Bank settlements. In fact, I have now visited or stayed in five different settlements. 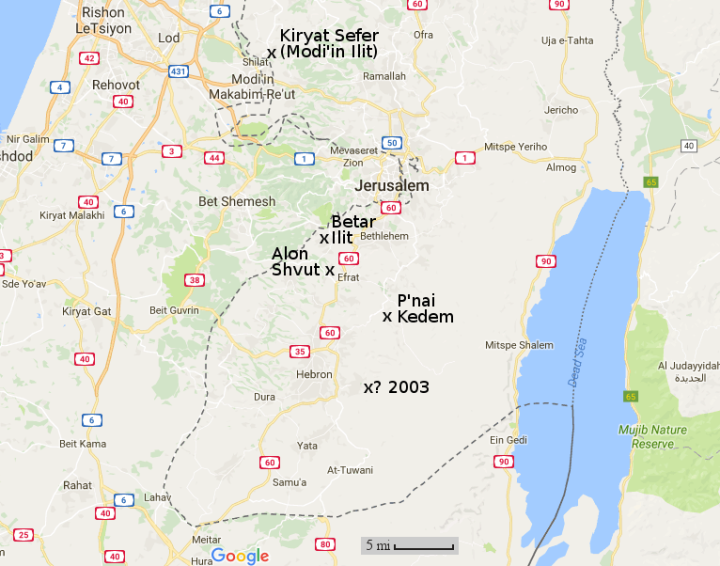 The map on the right shows the locations of these settlements, marked with an X. If you click on the image you can see a higher resolution version. Unfortunately, I do not remember the name of the settlement from my 2003 visit, though I know it was west of Hebron. It might have been Carmel, but I am not sure. I do know I have indicated its location with reasonable accuracy. Then there is the question of why Israelis even settle on this land. The assumption I and most people make is that they are there to gain and solidify their possession of the West Bank, for both political and ideological reasons. While partly true, this is actually not the main reason why people buy homes or rent apartments in these HOAs. Instead, they do it for basic economic reasons. Because the title of the West Bank is under dispute, and because it is also a place where there is a recognized threat of violence, the land is simply cheaper to buy. Renting an apartment in Jerusalem or in Israel is far more expensive. So is buying land. If you want to live near Jerusalem but don’t have a lot of money, living in a West Bank gated community is a smart and economical choice. In the end, this effort by Israelis to find affordable housing raises the value of the West Bank land, which has resulted in an increase in construction by both Israelis and Arabs. The image below, taken from the hilltop fortress of Herod in the West Bank just a few miles south of Jerusalem, shows both an Israeli settlement (with red roofs) and two Arab developments close by in the background, along with a great deal of other construction. And this image is very typical of the countryside surrounding Jerusalem in the West Bank. I must add that I now think I then underestimated the political reasons for living in these settlements. 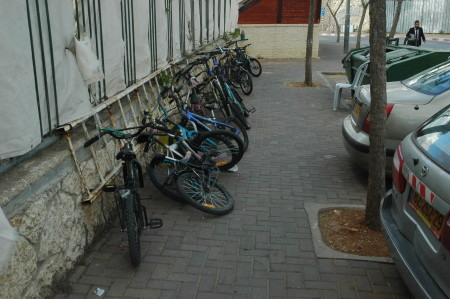 In many cases, these settlements are lived in by the more religious who do not commute to jobs in Jerusalem, but instead stay in their settlement to study Torah in the local kolel (an institute for full-time study). Nonetheless, the economic and practical reasons for these settlements cannot be ignored. More important, these larger settlements look nothing like what most people think a West Bank settlement should look like. The general expectation is a small collection of ramshackle mobile homes on top of a hill, surrounded by barbed a wire fence and looking out at nearby Arab villages that have been usurped from this property. 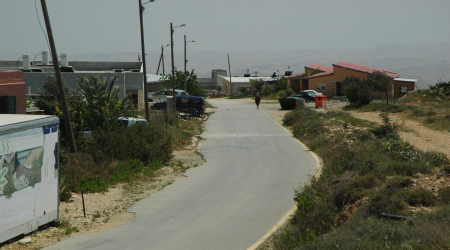 Not only have no Arab villages been usurped, but these larger settlements are nothing like ramshackle mobile homes. 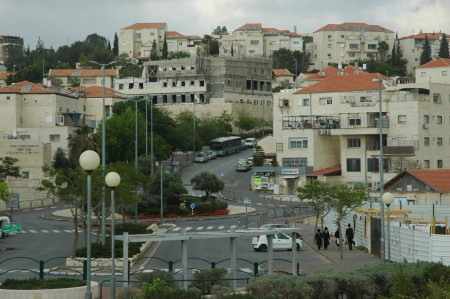 On the right is a picture of Beitar Ilit. 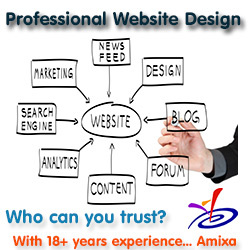 The city, which has a population of about 50,000, is similar to Kiryat Sefer (pop. 60,000) and Alon Shvut (part of the larger Gush Etzion region, pop. 70,000). All resemble neighborhoods in large urban cities, though their locations on steep hillsides forces their architecture to more resemble the terraced seaside villages of Greece and Italy. Of their many distinctive features, the one that struck me most this trip was the number of children. It seemed to me that the ratio of children to adults had to be close to 4 to 1, if not more. Every block had a small playground, and every playground was packed with kids when school is over. Furthermore, every building lobby or sidewalk was crowded with kids’ bicycles (see picture), since no one’s apartments are really large enough to store them. These large cities, filled with little kids, forces one to rethink any proposed two-state peace plan that says this land will be given to the Palestinian Authority. Will the Palestinians allow these children to remain in their territory, considering its avowed hatred of Jews and a desire to remove them all? And if they want to remove them, how will they do it? I fear the answer to that last question. In this trip I did get to visit one small stereotypical West Bank settlement, P’nai Kedem, as shown on the right. Located farther to the east on the edge of the Jerusalem urban area, this settlement is relatively new, occupied by only 54 families. It seemed that about half were in mobile homes, while the rest were eclectic private residences of all designs. The bigger cities had architecture that all looked the same, because of regulations and economics. Here, every home was unique. One was a log cabin. Another was a geodesic dome. Several looked like the typical southwest homes you see in Tucson. Since these were on private lots, there were fewer rules on how things could be built, so the owners took advantage of this to build to their personal taste. This, along with the lower land values because this location is more remote, are reasons people move here. The land itself on which P’nai Kedem is built is Israeli owned. They know this because a Palestinian challenged their legal title, which required them to do a thorough title search that eventually established without doubt that the land was purchased by Jewish settlers legally. It belongs to them. More important, the land was empty when purchased. In fact, the land is empty for miles around. Below is a panorama I took looking to the south and east from one end of P’nai Kedem. You can see the full resolution by clicking on the image. This settlement is on the eastern edge of all settlements near Jerusalem, both Israeli and Palestinian. To the east is practically nothing, all the way to the Dead Sea, which I was told could be seen on a less hazy day. There is more than enough room for everyone to build their own homes and live here. The bottom line as always is that ordinary people should be allowed to live wherever they want. They have that right. It is what ordinary people do, both Arabs and Jews. Anyone who suggests that one or the other should be banned, because of their religion or ethnicity, reveals themselves as either a bigot, or someone willing to appease bigotry for mere convenience. We should not tolerate it. Excuse my ignorance (and laziness)– what latitude is Israel? >What’s the climate? Exchange rate? … and, how much for a gallon of milk, pack of cigarettes, gallon of gas, and do they drive on the correct side of the road? Wayne: The climate in Israel is very comparable to the American southwest. It depends on your altitude and how close to the coast you are. In general it is a desert. The exchange rate is about 3.65 shekels to the dollar. They drive on the same side of the road as Americans. Ha, yeah…I know. I’ll reread your previous adventures & do some searching. I expect your travel posts are your most viewed, and with good reason. My understanding is that Jewish culture is more communal (viz: kibbutzes) than American culture: that there is more a societal expectation that one will put the community ahead of self. Jewish history provides reason enough for that. I would be interested in your take on this. Blair: The answer to your question is both yes and no. Jewish culture is very insular. Even when they are free to live anywhere instead of in an imposed ghetto, they still gather to create their own ghettos voluntarily. At the same time, there is a joke among Jews that if you have two Jews you will have three or more opinions. There are some very big factional divisions in Israel between the various Jewish sects, from the very religious to the very secular, that are not going away. I grew up during WWII in the most southern province of the Netherlands named Limburg, where the soil was rich, medium brown (blown from China) and when smoothed, yielded a greasy flat plane for territorial knife games. There I overcame my southern Catholic distaste for the Orange Protestant north. I look at your P’nai Khedem panorama and see today’s knife games on what may not the best the best of clay but for the world still empowered with its metaphors. I most dread the use of procreation as a not so subtle tool of gaining majority by both fundamentalist sides and surprised to not see more eruptions about Israel’s trajectory. We’re not Jewish, but our family joke is that if you get 5 of us together, we’ll have 10 opinions and they’ll all be wrong. Noah Peal: She is right. And sadly I predict that there are going to be more Jewish holidays like this, not yet celebrated. Israel is in the 30-33 degree (-ish) latitude range. So that equates to… Arizona/southern Texas. Gasoline–I’m seeing $6-8 a gallon with similar for a pack of smokes. Came across a series of British Pathe shorts from the late 50’s-late 60’s, highlighting everyday life in Israel. Absolutely beautiful crisp & clean color prints. I plan to support a Palestinian state as soon as there’s reason to believe it will support open borders. I’m not a Jew, but became interested as a kid in the birth of Israel and the immediate war it had to fight in order to survive. I haven’t seen anything in 70 years that has disabused me of my admiration for this underdog outpost fighting for a modern Western oriented culture against benighted foes from the Muslim nations. My feeling is that Israel should keep building whatever She needs. The distinction between neat, clean Israeli settlements and the camps on the other side tells all. All that being said, I just happened on this post at the Free Republic website where a lot of supporters of freedom hang out. Bill Henslee: Make time to read all the essays I wrote from my visits, reading them in chronological order. They will provide a real view of the situation in the West Bank, from someone who was there, not the lies and misinformation from the general press. This comment by the way is being typed in an apartment in the West Bank city of Beitar, where I am once again visiting family. Expect another essay in about a week or so, when I get home, with some more perspective. I’d be interested in hearing what the attitude towards Erdogan is in Israel.